6ix9ine, or Tekashi69, is a provocative New York rapper who has quickly grown to be one of the most polarising figures in the music industry. …and somewhat irrelevant to the quality of his music. Which isn’t to say the guy hasn’t made any legitimate hits. Tekashi’s older collaborations with ZillaKami accounted for some of the best hyper-aggressive trap music to come out over the past few years. However, as he has grown in popularity, 6ix9ine’s music has become far more commercialised. His aggressive posturing has become formulaic and his production has acclimated to be more industry friendly. Nearly every track on Dummy Boy features a high-profile guest vocalist, which speaks volumes about Tekashi’s inability to carry a project on his own. From a marketing stand point, his collaborations with Kanye West, Nicki Minaj and an incarcerated Bobby Shmurda were genius, in the sense they were always going to garner mainstream attention. However, a lot of these guest appearances have an inverse effect on the album by overshadowing Tekashi on their respective cuts. In addition, 6ix9ine’s forays into R&B duets and Latin pop were anticipated to showcase his range as an artist, but only resulted in exposing his lack of credibility as a singer. The opening track Stoopid featuring Bobby Shmurda is one of the album’s few highlights, exhibiting a stimulating beat and a catchy synth line. 6ix9ine’s flow on this track is eccentric and he comes across as being self-aware, frequently referencing his status as a silly, viral phenomenon of sorts. Another stand out track is Kanga featuring Kanye West. The bustling Tokyo Drift inspired beat is amusing and Ye’s performance on the cut is hilariously uninhibited. Explaining the appeal of this song is difficult, because nearly all of it’s elements are objectively low-brow while remaining infectious at the same time. 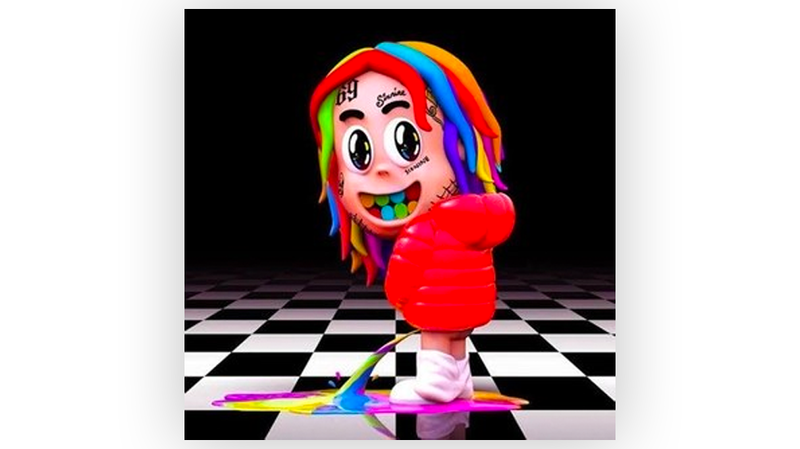 The absurdity of Tekashi doing his best Fatman Scoop impression on a track featuring Kanye West really illustrates the unpredictable climate of contemporary hip hop. Tekashi’s inclusion of Scott Storch’s production on the track Kika featuring Tory Lanez is another album highlight. The tropical trap instrumental is comprised of nice steel drum synth lines and low octave waves. Tory’s rubbery vocals compliment the beat nicely as he sings the tranquil hook, “I do my own stunts, Jackie Chan with it”. To be blunt, the remaining ten songs on this album are forgettable. Nicki Minaj’s dynamic charisma visibly outshines Tekashi’s washed autotune vocals on Fefe. Similarly, Puerto Rican singer Amuel AA runs away with the cuts Mala and Bebe, leaving Tekashi behind in the dust. If anything, 6ix9ine served as a detriment to these three songs. As he sits in a federal prison facing 32-years on racketeering charges, it’s hard to say whether or not this will be the last project we ever hear from 6ix9ine. While Dummy Boy is rather amateurish and two dimensional, this record served its purpose. The songwriting is low effort and the tracks are cobbled together, but it’s loud, obnoxious and in your face.